Six race cars from the Indianapolis Motor Speedway Hall of Fame Museum will be at the Canadian International AutoShow to celebrate the 100th running of the famous U.S. Memorial Day event at the Brickyard. 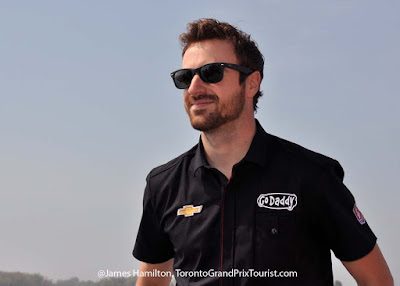 Joining the vehicles will be Verizon IndyCar Drivers - Conor Daly and local hero James Hinchcliffe (photo at top), on Friday, February 12. The car show continues at the Metro Toronto Convention Centre (north and south buildings) until the 21st. Open-wheel racing at the celebrated race track only took a short hiatus during World Wars but otherwise the 2.5 mile oval track has felt the fast rubber of the 'Greatest Spectacle in Racing' since 1911. The vehicles, a Duesenberg, Ford V8 Miller, Cummins Diesel, Lotus Type 56 "Wedge" Turbine, Rislone Special and a Norton Spirit (see more info on the cars below). In addition to the IndyCars there will also be some famous Canadian cars - a replica of Jacques Villeneuve's 1995 Indy 500 winning car, and Sott Goodyear's 1992 Lola Mackenzie Financial which took second place at the 500. "The AutoShow is offering discount tickets to the 2016 Honda Indy Toronto. Please visit autoshow.ca/tickets for more information. About the Indy Cars coming to the 2016 Canadian International AutoShow." In the 1914 Indy 500, 23-year-old Eddie Rickenbacker was the 10th driver to pass the checkered flag driving the 1914 Duesenberg he would later drive to a win on a 300-mile dirt track in Sioux City, Iowa, later that summer. The 4-cylinder, 360-cubic-inch Duesenberg was one of two entered in the 1914 Indy by German-born engineering brothers Fred and Augie Duesenberg. The brothers formed the Duesenberg Motor Company in St. Paul, Minn., before relocating to Indianapolis in 1920 where they produced some of the most sought after passenger automobiles of the 1920s and ’30s. The Indy 500 is not all about triumph and celebration. There is only one winner, and lots of heartbreak along the way. Ford teamed up with famed car builder Harry Miller in 1935 to build a team of V8-powered cars with a 220 cubic inch engine for the Indy 500. But the Ford V8 Millers arrived late and only four of the 10 built qualified for the race. But that was just the start of the problems. None of the four finished the race, each stalling with the same basic design flaw: the steering box was installed too close to the engine block, causing the gears to seize and making it too difficult for the driver to navigate the corners. The Ford V8 Miller coming to Toronto was driven by Ted Horn before he pulled out of the race after 145 laps, good enough for a 16th place finish. By coincidence, the Cummins Engine Co. had a truck diesel engine that was just the right size for a new engine class at the Indianapolis 500 in 1950. The bored out and supercharged 401-cid straight 6 pushed out 340 horsepower and ran well fitted to a Kurtis chassis. Driver Jimmy Jackson, who picked the paint colour and dubbed it the ‘Green Hornet,’ reached a qualifying speed of 129 miles per hour and had moved from his starting position of 32nd to 16th place when an accessory part broke on the 52nd lap. He finished that race 29th, but the ‘Green Hornet’ would go on to set six world records at the Bonneville Salt Flats. That success drove Cummins to commission another diesel project that resulted in Freddy Agabashian winning the 1952 pole position. But that was the last time a diesel-powered car made the Indy 500. For the 1968 Indy 500, STP Corporation requested the English company Lotus produce four wedge-shaped chassis to be powered by Pratt & Whitney ST6 gas turbine engines and using Ferguson four-wheel-drive units. Three were designed by Maurice Phillipe, and two of those were sitting one-two at the pole after qualifying, with driver Joe Leonard setting a four-lap average speed track record of 171.559 miles per hour. Graham Hill started second in the car that will at be at the AutoShow after posting a qualifying speed of 171.208 miles per hour. He was running fourth in the race when his right rear suspension collapsed on the 110th lap, causing him to strike the outer retaining wall in turn two. Racing legend Bobby Unser won his first of three Indy 500s in a Leaders Card Racers-owned Rislone special — a 161-cubic-inch, turbocharged, Offenhauser-powered 1968 Dan Gurney Eagle. During a practice run, Unser became the first person to turn an unofficial lap in excess of 170 miles per hour, and he qualified for the outside of the front row with a four lap average speed of 169.5 miles per hour. During the 1968 race, Unser led the pack for 127 of the 200 laps and won with a then-record average speed of 152.882 miles per hour. Another Bobby Unser car, this one didn’t actually make it into the Indy 500, but was the backup vehicle and “twin sister” to the Norton Spirit Unser drove to a fifth-place finish that year. This car was driven exclusively during practice and at other races throughout the 1979 season. The chassis was built at the Penske facility in Poole, England, then shipped to the U.S. In the primary car in 1979, Unser led for 89 laps and appeared to be on his way to his third Indy title when he lost top gear in the final stages and dropped to fifth place at the checkered flag. In the trial runs prior to the 1992 Indy 500, Canadian Scott Goodyear actually failed to qualify, missing the field by a fraction of a second. But Walker Racing made the decision to give Goodyear its team’s qualified spot in the race to its primary driver, but doing so put Goodyear 33rd of 33 cars on the starting grid. In his 1992 Lola, built in Indianapolis and powered by an Ilmor Chevrolet 265 V8t engine, Goodyear moved his way through the field to come within .0043 of a second of winner Al Unser Jr. at the finish line. It remains the closest finish in the illustrious history of the Indy 500. British-based Reynard Motorsports was at one time the world’s largest racing car manufacturer — and built the chassis that carried Jacques Villeneuve to the Borg-Warner Trophy, the only Canadian to ever win the Indy 500. Villeneuve’s #27 Reynard 95i was powered by a Ford Cosworth XB engine that paced him to a qualifying speed of 228.397 miles per hour, good for fifth on the starting grid of the 1995 race. During the race, he overcame a mid-race two-lap penalty to take the checkered flag. His victory at The Brickyard broke a seven-year Indy 500 winning streak by Ilmor-constructed engines."